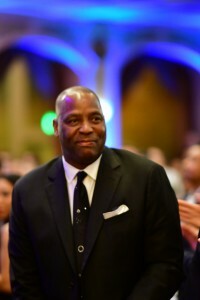 At the 82nd Seattle Star of the Year awards, the Sounders were the story of the year, and the Huskies’ Kelsey Plum and the Seahawks’ Bobby Wagner were honored as 2016’s top stars. Lenny Wilkens, coach of the town’s first major pro sports championship team, the 1979 Seattle SuperSonics, had the perspective and the clarity for the big stage. 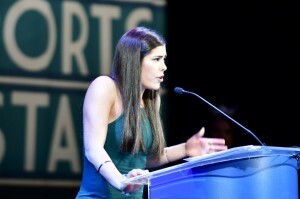 Never has the 82nd annual Sports Star of the Year event had such a feast of success. The Sounders won the MLS Cup, the University of Washington football team returned to relevance with a Pac-12 Conference championship and a berth in the playoffs, two UW women’s teams, basketball and golf, reached national pinnacles, and the Seahawks won a playoff game for the sixth time in seven years. But a blast from Seattle’s past electrified a big crowd at the Paramount Theatre Wednesday night. 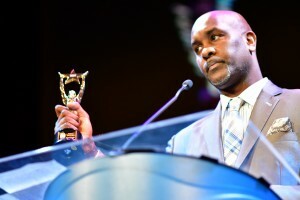 Saying he “was born in Oakland, but I was born in Seattle too,” Gary Payton, the evening’s Royal Brougham Legends Award winner, was saluted by the Seattle Sports Commission with an unofficial but meaningful retirement of his jersey from the departed franchise. After he was introduced by former Sonics play-by-play voice Kevin Calabro, Payton took the stage as replicas of the six retired jerseys dropped from the ceiling to the top of the big video screen — Wilkens, Nate McMillan, Spencer Haywood, Gus Williams, Fred Brown and Jack Sikma. In the middle was Payton’s No. 20. “I wish we could have it for real with the Sonics,” he said as the roaring ovation settled. “I won’t let Oklahoma city retire this jersey. From 1990 to 2003, The Glove raised hell in Seattle and the NBA. The nine-time All-Star was the whirlwind in the middle of the greatest time in Sonics history, from 1993 to 1998, including an appearance in the 1996 Finals against what was probably the greatest team in NBA history — the Michael Jordan-led Chicago Bulls that won 72 games. Backstage, Payton talked about that pinnacle moment that fell short, the Bulls winning 4-2. He couldn’t get over the fact that coach George Karl didn’t have him matched on Jordan until the Sonics were down 0-3 in the series. Retired, yes. But not from being a competitor. The 2016 Seattle sports scene, however, did have the happiest sports ending — the first championship for the Seattle Sounders, whose preposterous rise from the midseason depths in July to the championship in December was judged by online voters to be the Seattle sports story of the year. The other two winners of the public vote were University of Washington’s Kelsey Plum and Seahawks linebacker Bobby Wagner. The event, co-hosted by Seahawks play-by-play man and KIRO-TV news anchor Steve Raible and ESPN’s Kenny Mayne of Kent, had a memorial moment for Bob Walsh, the peripatetic sports promoter who brought Seattle three Final Four basketball tournaments and the 1990 Goodwill Games. He died last month at 76. Raible recalled a trip he took with Walsh in 1989 to Moscow’s for meetings preparing for the games. A visit to Red Square and a long line of visitors to Lenin’s Tomb caused Raible to wonder whether they would be safe. A senior, Plum will end her Washington career as the most decorated player and prolific scorer in program history. She is a finalist for the Nancy Lieberman Award, which recognizes the top point guard in women’s Division I, and is a candidate as well for the Naismith, Ann Meyer Drysdale and Wade trophies. The all-time leading scorer in Washington and Pac-12 history, Plum is averaging a nation-best 30.9 points per game. She has scored 30 or more in a game 12 times and 40 or more four times, including a school-record 44 four times. Plum also leads the NCAA in made three-pointers (88), field goals made (263) and total points (772). The Poway, CA., native tops the No. 8-ranked Huskies with 5.1 assists per game, which is fifth-best in the Pac-12. In addition, Plum ranks fifth in the Pac-12 in assist/turnover ratio at 2.0. Earlier this season, Plum became the first player in Pac-12 history to reach 3,000 career points. She currently has 3,190, third-most in NCAA history. Nominees: Julianne Alvarez, University of Washington women’s golf; Courtney Schwan, UW volleyball; Sierra Shugarts, Western Washington University women’s soccer; Breanna Stewart, WNBA Seattle Storm. In 2016, Wagner produced the best statistical season by a Seahawks linebacker. He led the NFL and established the franchise single-season record with 167 tackles (85 solo). With 15 tackles vs. Philadelphia (Nov. 20), Wagner became the first player in Seattle history to record 100 or more tackles in five consecutive seasons. Wagner posted 10 double-digit tackling performances in Seattle’s 16 regular-season games and another in the NFC wild card round (vs. Detroit). To that, Wagner added 4.5 sacks and 18 quarterback hits as the Seahawks won the NFC West for the third time in four years. Wagner also made first-team All-Pro (Associated Press) for the second time in his career and earned a starting spot in the Pro Bowl for the third time. He served as an NFC team co-captain in that game. Nominees: Jake Browning, UW football; Nelson Cruz, Mariners; Gabe Marks, Washington State University football; Jordan Morris, Sounders FC. When Brian Schmetzer assumed head coaching duties from Sigi Schmid July 26, the Sounders stood ninth in the Western Conference (6-12-2, 20 points) and their chances of reaching the postseason seemed nearly impossible by one major metric: No team in MLS history made the playoffs after having 20 or fewer points through the season’s first 20 matches. But the Sounders, sparked by MLS Rookie of the Year Jordan Morris, went on a remarkable 8-2-4 turnaround that included wins over FC Dallas and the Colorado Rapids in the Western Conference semifinals and finals, then topped Toronto FC in the MLS Cup 5-4 in a penalty-kick shootout. Roman Torres banged in the championship clincher following a series of spectacular saves by goalkeeper Stefan Frei, the match’s MVP. Underscoring the improbability of its title, Seattle played the final stretch of the season without leading scorer Clint Dempsey (heart irregularity). The Sounders also became the first team in Cup finals history to fail to produce a shot on target throughout the game. Additionally, the Sounders’ three shots overall were the fewest in a title game. And Schmetzer became the first coach in league history to take charge of a team at midseason and lead it to a championship. Nominees: Ken Griffey Jr. enters Baseball Hall of Fame; Huskies make College Football Playoffs; Seahawks win NFC West for the third time in four years; UW women’s basketball leaps into Final Four; UW women golfers are national champions.